After a long day, digging into a hearty pasta dish or a piping hot bowl of soup can fill you with warmth and coziness — especially on those chilly days. * Combine frozen and prepared foods with fresh produce. Frozen meals and pizzas, as well as chilled pasta, are the perfect bases for balanced meals and come in many varieties. Shop the refrigerator and freezer sections for your favorite dishes that you can simply pair with fruits, vegetables, whole grains and low-fat dairy to create a balanced plate. It can be much easier and less time-consuming than cooking a full meal from scratch, and leave you more time to do other activities beyond cooking. * Try recipes featuring a balance of protein, dairy and vegetables. Cozy up on the couch with a rich and tasty mug of minestrone soup loaded with seasonal vegetables. Adding refrigerated pasta like Buitoni Three Cheese Tortellini helps make it a complete meal, cutting time spent on preparation, but not on taste. 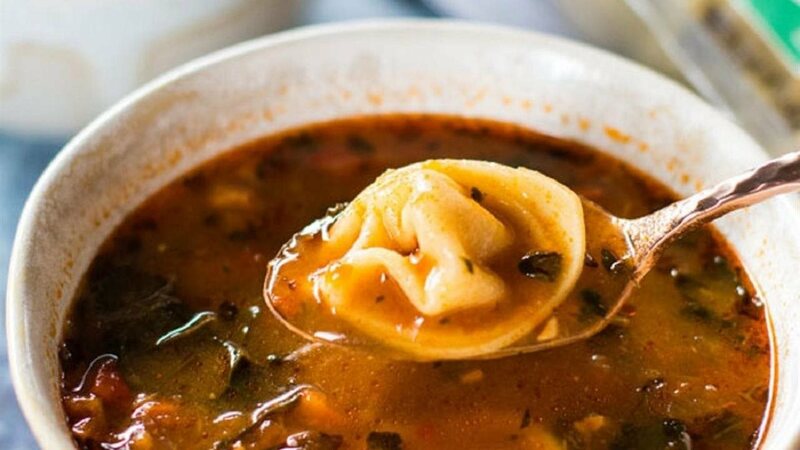 The blend of ricotta, Parmesan and romano cheeses in the tortellini perfectly complements veggies like sweet potatoes, kale and carrots in a steaming, herby broth. Try the sample recipe below! * Strategically mix in vegetables. There are several ways to sneak veggies into your favorite comfort foods. Sprinkle greens into scrambled eggs and quiches, incorporate shredded zucchini and carrots into baked goods, add spinach or broccoli to spaghetti sauce, or make pumpkin waffles. The possibilities are endless. * Use fruit to indulge your sweet tooth. For many people, comfort foods are all about desserts. Those striving to eat healthier can still enjoy their sweets in moderation, but may wish to incorporate ingredients like fresh fruits so they also offer greater nutritional value. Consider warm berry cobblers, baked apples, carrot cake and/or smoothies that make use of fruits and even veggies. Pre-heat instant pot to the sauté "normal" setting along with 1 teaspoon of oil. Add the bacon and cook for 5 minutes, then add the rosemary, thyme and sage. Cook for 3 more minutes or until the bacon is golden in color, then add the onions, carrots, bell peppers, red pepper flakes, 1/2 teaspoon of salt and a few cracks of pepper. Mix well and turn the sauté setting to "more" on the instant pot and cook for 8 minutes. Add the garlic and cook another 6 minutes, or until the veggies are soft and have wilted down by a good amount. Add the tomato paste and cook for 1 minute, then add the kale, crushed tomatoes, beef stock, dried beans, Parmesan rind, bay leaf, 1/2 teaspoon salt and a few cracks of pepper. Make sure you don’t add liquid past the max line on the instant pot. Mix well and check for seasoning; you will likely need a bit more salt. Press cancel on the instant pot, put the lid on, and set to pressure cook on high for 40 minutes. Once the cook time is done, let the instant pot sit for 10 minutes, then carefully release the pressure manually. Make sure to remove the bay leaf and Parmesan rind. When the soup is ready, bring a 4-quart pot of water to boil and cook the Buitoni Three Cheese Tortellini according to package instructions. Drain well and add the tortellini to the pot of soup and stir. Make the crostini by seasoning the tomatoes with 1 teaspoon of oil, 1/4 teaspoon salt and a couple cracks of pepper, and roast in a 400 F oven for 15-20 minutes. Once the tomatoes start to burst they are ready. Toast the bread, schmear on some ricotta cheese, spread on the Buitoni Pesto with Basil and top with roasted tomatoes. Serve the soup with the crostini and enjoy! Soup will keep for 3 days in the fridge or can be frozen for 3 months. After a long, chilly day, digging into a hearty pasta dish or a piping hot bowl of soup can fill you with warmth. * Combine frozen and prepared foods with fresh produce. That can be much easier and faster than cooking a full meal from scratch. * Try recipes featuring a balance of protein, dairy and vegetables. Cozy up on the couch with a rich and tasty mug of minestrone soup loaded with seasonal vegetables. Adding refrigerated pasta like Buitoni Three Cheese Tortellini helps make it a complete meal, cutting time on preparation, but not on taste. * Use fruit to indulge your sweet tooth. Because fruits offer greater nutritional value, consider warm berry cobblers, baked apples, carrot cake and/or smoothies.